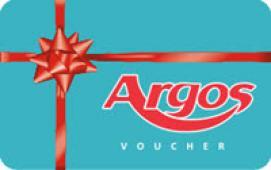 Argos is a unique retailer recognised for choice, value and convenience. It sells general merchandise and products for the home from over 700 stores throughout the UK and Republic of Ireland, online and over the telephone. In the last financial year, Argos sales grew 8% to £4.2 billion and it employed some 34,000 people across the business.Argos serves over 130 million customers a year through its stores and takes four million customer orders either online or over the phone. On average, 17 million UK households, or around two thirds of the population, have an Argos catalogue at home at any time. Argos expects to add around 30 stores per annum with the chain expected to exceed 800 over time. Its internet site is the second most visited internet retail site in the UK. Argos is part of Home Retail Group, the UK's leading home and general merchandise retailer. This voucher is redeemable only in Great Britain. Your gift code will be emailed and posted to your account profile, under "My Gift Cards" within 10 business days of verifying your purchase.